Akaso is a trail camera that produces high-performance photo and video with an automatic infrared sensor for a bright night vision. It also serves any other purposes like surveillance, etc. It is a waterproof hunting camera, and its water resistance is up to IP66. Like any other trail cameras, this device offers a fast trigger that is fast enough to capture breathtaking moments in the wild. This camera does not come with a memory card but supports up to 32 GB. For it to operate, it requires 4 AA batteries, but you can extend it up to 8 AA batteries good for 6 months. Akaso features a 12 MP crystal-clear photo and 1080P video with sound during the day. It lets your trail camera capture more detailed with sharper image quality. At night, Akaso captures black and white pictures and videos. A multi-shot feature is also available and could take 3 photos per motion detection. It is also with a broader angle view. It has a full angle of 120 degrees and 65 feet distance range. It detects more wildlife animals within a larger area. It also has a 2.4 inches color LCD screen. It allows you to playback videos and review pictures before starting the operation. It also does not require you to review and replay on any personal computers. This camera also features a bright night vision, of course, at night. With its automatic infrared sensor, this game camera can capture movements of wildlife way clearer at night by its 24 pieces infrared LEDs. Through the camera’s professional infrared sensor and the 24 pieces LEDs, your camera can capture the behavior of wildlife more clearly and quickly. Any movement or motion is detected from 65 feet or 20 meters away from the camera. Also, its infrared detection range is up to the same feet or meters. Additionally, the camera is housed in a weatherproof case with its IP66 waterproof level for the different kinds working environment. This means that this device can work in any weather conditions because it has a protective case. Akaso is also easy to install for wildlife view and home security. Other than that, this device features its 0.5 seconds fast trigger speed. It can capture motions quickly and accurately. This will not let you miss any action in the wild. You need 4 AA for the camera to operate, and you can expand it up to 8 AA batteries for more extended use – 6 months. Moreover, Akaso TC03 trail camera includes temperature, date, time, timer shooting, real-time replay, password protection, time-lapse, and many more options. The details you wanted to be stamped in your photos and videos are optional. You could set it if you wanted it to get stamped or not. The flash is not visible at night or even during the day. It cannot intrude the wildlife, and the people might not be able to notice the camera, especially for security purposes. You can view, delete, or replay images and videos on the 2.4 inches screen, right on the camera. You would not be needing to bring your laptop into the woods and having to worry about damaging it. There will be no shuffling of SD cards from one camera to the next if you have bought many. With the camera’s screen also, the parameter set up is very much easy. The picture and video quality are excellent. For good quality cameras, the images are crystal clear for both the daytime and nighttime. The night shots were excellent quality as long as the subject is near the center of the camera’s view. The quality of the picture can be adjusted. You can set it as 1080P anyway given that the SD card has an ample storage space. The images you captured has the details such as time, date, temperature, etc. You can even set the video for a variety of time lengths. You can also set the quality to the lowest to save even more and to record longer because lower quality does not take too much space. The camera is compact. It is a spray water protected device, and extreme temperatures might not be a big deal for this camera. You may put the camera in your backyard for one night with freezing temperature and find out that the camera seems to be working as it is. In using this camera, you might experience difficulty in setting it up. You may find out that the playback keypad controls are odd and might say that it is not user-friendly. You may have to struggle with figuring out how to scroll through the images and play the videos without having to reset it at the beginning. The buttons might work very poorly. And the same button seems to change functions at random inexplicably. Say, for example, the down button you use to scroll through your photos also randomly turns into a magnifying function of some kind. Then there are also times that the buttons just stop working altogether and you have to power cycle the unit. You might also find the motion sensor as entirely too sensitive that it picks up every single leaf, swaying blade of grass, and raindrop. That might be good except that this trail camera is designed to be set up in the woods which are full of leaves and grass. As a result, the situation just turned the setting like into a time-lapse function even though you’ve not set that function up in the first place. Once you set it up overnight with that situation, you will be pleased to discover a thousand crystal clear images of absolutely nothing. Consider the instance that the camera may have crystal clear photos, but that is unless it rains. The lens might fog up, and you capture a foggy gray picture of nothing. It may seem that there is condensation under the camera lens after using it for let us say, 2 weeks. The water droplets may severely distort the daytime pictures. Like if there is any sunlight, the image might thoroughly wash out. And it might not be the rain which caused the condensation, but the temperature change. The camera might also leak around the factory sealed lens enclosure after only a few months. It might be securely locked, but it may leak anyway after a significant rain storm. This does not guarantee that the camera is waterproof as advertised. You may get it in the rain one evening, and the lens might get clouded up with water and will never dry out. You might capture foggy gray photos and pictures will become obscure because of the water in the lens. Other than that, you might also get a unit with a small flash for night use. The pictures at night might be very grainy, and the flash is insufficient in the distance. Beyond 10 feet it is useless, and even within that short distance, it is hard to identify what is in the picture. Like any object, more than 5 meters from the flash is invisible. Even the ones which had animals within 5 meters might be of inferior quality. The camera quality also might be mediocre for you. You might experience that the illumination at night is only for things that are very close. And, the camera does not start recording until 5 seconds after it is triggered. This trail cam might have a slower trigger time than what is advertised. You might also experience that most of the time, the recording starts not 0.5 seconds after the animal has walked past the field of view. The pictures might not be bad, but the camera is cheaply built. The video quality might be weak as well. There is a 720p and 1080p option, but both might be very grainy. And the SD card slot is situated in a spot that makes it very difficult to remove the card. You might want to have been supplied a tool to help grab the card. The screen might not also be a super high resolution. The infrared might be weak for your preference. The daytime pics might be just dark for you. The Akaso makes a funny sound when you turn it on and off, and it is not what you want in silent woods. It is not also shaped well to fit the tree, and it is loose. The strap might not last long. 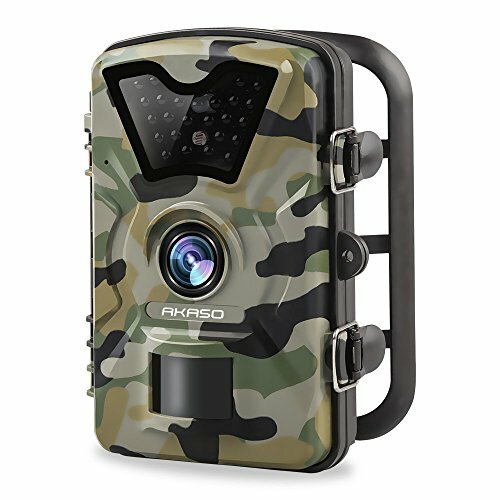 Akaso trail camera is best for those who wanted to have a multi-purpose camera with lots of settings to satisfy their demands. It is for all the consumers who prefer good quality photos and videos. This product is suitable for all the hunters who wanted to have a good shot of the wildlife in the woods. This is recommended to those who wish to have an invisible flash to be able to keep their hunting quiet and does not disturb the wildlife’s habitat. It is also recommended to all who do not usually leave the trail camera in the woods at night in avoidance of possible fogged up camera.